After surviving Indian attacks and the upheaval of the American Revolution, the pioneer Adam Holliday built his homestead on the banks of the Juniata River. By 1796 Holliday had become prosperous enough to begin laying out a townsite on a gently sloping hill in this scenic river valley. There were still only a few houses and farms existing on the location when Adam's son, John, opened a "rude" tavern in 1814. The completion of the Huntingdon, Cambria and Indiana Turnpike in 1818 made Hollidaysburg a popular stopping place for travelers. Still, the town remained small; an 1830 census listed only 70 inhabitants. The Pennsylvania Canal's completion in 1832 changed all that. Hollidaysburg was now open to trade with Philadelphia and the East, and two years later the Allegheny Portage Railroad connected the canal and Hollidaysburg with the Great American West. Hollidaysburg, as the western end of the canal system, was a vital link in the development of such important industrial cities as Johnstown and Pittsburgh. At this point in history, 1835, the U.S. Hotel was conceived. John Dougherty built the Hotel to accommodate westward travelers with convenient food, lodging, spirits and as gaudily painted signs of the era denoted; entertainment for man and beast. The U.S. Hotel and the town of Hollidaysburg were now in their heyday with the economic boom that directly related to the town being chosen as the terminal for transfer from the canal to the railroad that carried passengers and freight, via Foot-of-Ten, over the Allegheny Mountain summit. The iron industry boomed and cheap canal transportation kept business flowing with the waters. In 1837, Hollidaysburg had 14 daily canal boat lines, and the Juniata Street basin was the center of warehouses for shippers and traders. This activity kept the tavern trade bustling and the hotel rooms full. Hollidaysburg status as a national transportation center lasted only 20 years. With the completion of the Pennsylvania Railroad mainline in 1854, Altoona became the new hub of transportation. The original U.S. Hotel survived the "Canal Era" and remained intact, servicing the new railroad industry until the building was destroyed by fire on November 29, 1871. In 1886, German immigrant Engelbert Gromiller, rebuilt the U.S. Hotel. A brewmaster by trade in his Bavarian homeland, Engelbert established a brewery in the building next door where the mules were previously housed. 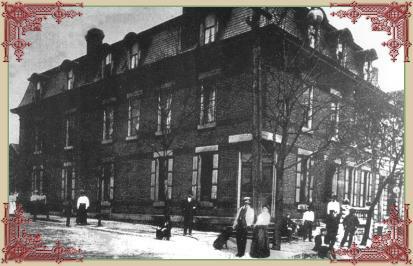 The Hotel was noted in a newspaper account of the day as having the best $1.50 a day house in the borough. In 1905 the cut block barroom was added to the brick structure. This section is still the barroom today and boasts such original relics as a hand-carved mahogany back bar, beveled silvered mirrors, hand leaded stain glass windows and a brass foot rail, under which flows a still active water trough spittoon. This barroom operated continuously until prohibition. During World War II, the Navy set up a radio school on the site, billeted men in the Hotel and used the tiled bar area as a shower room. When the Gromiller family sold the business in 1945, the bar was reassembled. The Hotel changed hands several times in the next half century and began falling into disrepair. The deteriorating brewery had to be destroyed. Since 1987 the Hotel has gone through some monumental changes and its original grandeur is being restored for your entertainment. This landmark's history is being recognized and appreciated by not only Hollidaysburg's people but once again by the hungry gourmet willing to travel to experience the "best fine dining in the borough"! Karen and Jason Yoder, the U.S. Hotel proprietors and your hosts, wish you the most enjoyable dining experience and thank you for your pleasant company.